What Height to Put a Range Hood? Range hoods require careful placement to ensure they're both safe and functional. A range hood that is too close to the cooktop could pose a fire hazard, while one that has been installed too high likely won't be able to do its job of removing smoke, grease and steam. Along with standards like countertop height and cupboard depth, there are also standards for the height of range hoods. Most contractors will be aware of such standards, but do-it-yourself homeowners may not be. 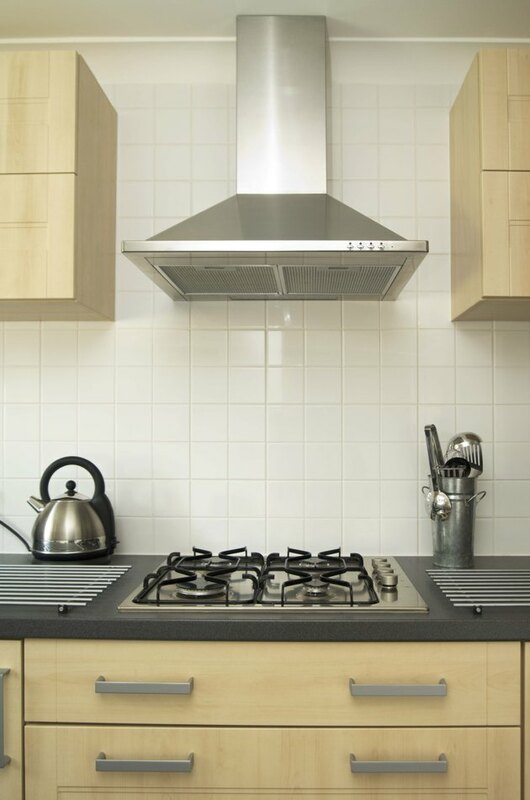 A properly installed range hood ensures healthy air quality in the kitchen. Because range hoods vary from high-capacity models to standard range hoods, so do the heights at which each should be installed. High-capacity models are able to fan kitchen odors into their hoods at a greater velocity, so they can be installed a bit higher than standard models. High-capacity range hoods are typically installed between 24 and 30 inches above the cooktop, while standard models are installed on average between 18 and 24 inches above the surface of the cooktop. Sometimes contractors prefer to measure the height of the range hood they are installing from the floor rather than from the surface of the cooktop. When this is the case, the bottom of the range hood typically measures 60 inches from the floor. In addition to the height of a range hood, it is also important to consider the capture area of the range hood. This area is defined by the size of the stove underneath it. The "capture area" should be larger than the surface of the cooktop. A stove that measures 36 inches from side to side should be paired with a 42-inch-wide range hood. What Is the Typical Size of a Microwave?